To install a ladder jack, a worker removed the mid-rail of a guardrail on a carpenter’s bracket scaffold. The mid-rail was not replaced once the ladder jack was installed. Later that day, the top-rail was lowered so other workers could install a drip edge along the roofline. The top-rail was re-installed using a single 3½” nail on each vertical support post. The nails were only hammered 2½” deep. While installing the drip edge, a worker stumbled backwards into the top-rail which failed, causing him to fall 5.8 m.
WorkSafeNB regularly investigates accidents due to the improper installation and use of carpenters' bracket scaffolds on construction sites. 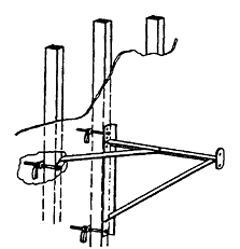 This publication’s purpose is to heighten awareness of the proper installation techniques and use of these brackets to prevent scaffolds from collapsing. Exceeding the maximum intended load on any particular section. No more than two employees and 75 lbs of tools and materials should occupy any given eight feet of the bracket at one time. Using nails to attach brackets to the wall, rather than the required bolts. Using homemade brackets that have not been rated by a qualified engineer. Attaching scaffolds only through the wall sheathing and not through or around a wall stud. Not following the manufacturer’s recommendations during the scaffold installation, including guardrail installation. Attach the scaffold to the structural wall with the bolts going all the way through the stud and sheathing. A bolt size of at least ⅝” in diameter is recommended. An alternative would be to attach the scaffold with J-bolts going through the sheathing and around the stud. When installing scaffolds, follow the manufacturer’s recommendations for bracing. Manufacturers commonly supply a diagonal brace extending from the top bracket, near where the planking rests, back to the wall. The brace is used to stabilize the bracket. According to most manufacturers, braces can be secured with a nail. Refer to the manufacturer’s instructions for the size of nail to use. Ensure a maximum bracket spacing of no more than 2.4 m on centre. Platforms must be at least 500 mm wide and fully decked. Ensure that a carpenter’s bracket scaffold platform 3 m or more above the adjacent ground or floor is provided with a guardrail, or that occupants use fall-arresting systems. Ensure that no more than two people are on a scaffold section at any one time, and a means of access, such as a ladder, is provided and secured.